Obama names Stanley Fischer, former Governor of the Bank of Israel, as his nominee for vice chairman of the Federal Reserve. 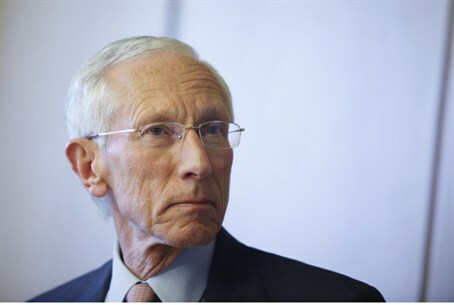 Stanley Fischer, former Governor of the Bank of Israel, will be nominated to serve as vice chairman of the Federal Reserve, the Obama administration said on Friday, according to Bloomberg. Fischer, 70, would replace Janet Yellen, who was approved by the Senate this week for the chairmanship of the U.S. central bank. Reports of his being the leading candidate for the position first surfaced last month. Yellen will replace Ben S. Bernanke, whose term expires Jan. 31, as chairman. Fischer earned a reputation as a trailblazer as the first central banker to cut interest rates in 2008 at the start of the global crisis and the first to raise them the following year in response to signs of a financial recovery. He also bought up foreign currency in unprecedented amounts to drive down the value of the shekel and boost exports, more than doubling reserves. From 1988 to 1990, he was chief economist at the World Bank. After returning to teaching at MIT, Fischer joined the International Monetary Fund as deputy to Managing Director Michel Camdessus in 1994, working to resolve financial crises in Mexico, Russia and Southeast Asia. He left the IMF in 2001 and joined Citigroup as a vice chairman. In 2005, Fischer accepted Israel’s offer to head its central bank, and became an Israeli citizen, one of the job requirements. In 2011, Fischer attempted to run for the position of head of the International Monetary Fund, but he was disqualified due to the fact that his age at the time was two years beyond the ceiling set by the organization’s bylaws. Fischer stepped down as governor of the Bank of Israel on June 30, midway through his second five-year term. Fischer’s resignation from the Bank of Israel was followed by an embarrassing saga, whereby the bank went without a governor for more than 100 days. The position was originally offered to Professor Jacob Frenkel, who previously served two terms as the Governor of the Bank of Israel between 1991 and 2000. Frenkel, however, withdrew his candidacy because of allegations that he shoplifted an item in Hong Kong several years ago. Prime Minister Binyamin Netanyahu and Finance Minister Yair Lapid then offered the position to Professor Leo Leiderman but he, too, withdrew his candidacy for the position. Finally, after facing criticism for not having done so right away, Netanyahu and Lapid appointed to the position Dr. Karnit Flug, who had been Fischer’s deputy and had been recommended by Fischer himself as his successor.